Nadodikattu (Malayalam: നാേടാടിക്കാററ്; Translation: Wandering Wind) is a 1987 Malayalam Indian comedy movie directed by Sathyan Anthikkad; starring Mohanlal, Sreenivasan, Thilakan, Innocent and Shobhana. Scripted by Sreenivasan, it represents popular Malayalam cinema at its best and established the Mohanlal-Sreenivasan combination as one of its most memorable and bankable cinematic pairs. The movie has been considered as one of the masterpieces during golden age of Malayalam Cinema and the story, dialogues and characters have achieved cult status in Malayalam movie history. Nadodikattu drew upon relevant social factors affecting Kerala such as poverty and unemployment, which, along with excellent scripting and comic performances, contributed to its runaway success. It gave way to two sequels, Pattanapravesham and Akkare Akkare Akkare by Priyadarshan. Nadodikattu opens by introducing the two lead protagonists, Ramdas aka Dasan (Mohanlal) and Vijayan (Sreenivasan), who are employed as ill-paid peons. A commerce graduate, and proud of that fact, Dasan frequently vents his frustration in having to serve lesser qualified superiors and having to settle with lesser than what he feels he deserves in life. Vijayan, his poorly-educated, comic sidekick, is also his roommate and sole friend. Their relationship is one full of tension, with Dasan adopting a superior stance on the account of his education and good looks, which fiercely rattles Vijayan. Several comic situations later in the film borrow from this aspect of their characters. Dasan constantly bosses Vijayan to do all the household work as well other chores. Dasan and Vijayan, being hopeful that they would get a better job once the new Managing director joins their company, waits for him to take charge. However, one day, on the way to office, they get involved in an unnecessary altercation with an unknown person. Dasan, in turn to grab attention from a lady, abuses the person and pushes him to muddy water. Vijayan punctures his car tyres. But when they reach office, they find out that the person is their new managing director. Both vanishes from office and surfaces on next day. Both tries to disguise with Dasan wearing a dark sun glass and Vijayan having a long beard. Both try to convince the supervisor that they were seriously ill on last day. But they are made to report to the new managing director. They fool the MD for first time and starts work. But the MD soon finds out the truth from old office photographs and both get thrown out of the company. Being jobless, their house owner (Sankaradi) convinces them to take bank loan and buy two cows. Dasan and Vijayan, upbeat about the new business, starts dreaming about a bright future. However they soon find out that the cows yield very less milk and the business fails. The bank contacts them for defaulting the loan. To escape, Vijayan brings up the plan to sell cows and go to Gulf with whatever money they get. Enters Gafoorkka (Mamukkoya), an agent who promises that he would take them to the Gulf. Gafoorkka explains them that his goods boat going to California will be diverted through Dubai sea shore for them. Gafoorkka also instructs them to wear Arabic dresses to fool the authorities. Dasan and Vijayan once again start dreaming about the bright and luxurious life ahead. On reaching the sea shore, both change into Arabic dress. Two strangers start following Dasan and Vijayan and forcefully exchange their suitcases. Confused, Dasan and Vijayan starts exploring the city. They are surprised to see no Arabs in the city and soon find lot of boards in Tamil. They realize that they have been cheated by Gafoorkka who has off loaded them in the southern Indian city Chennai, Tamil Nadu. Dasan and Vijayan check the suitcase and find out drugs inside. They contact local police and hands over the suitcase. Meanwhile, the strangers who are actually gang members of Ananthan Nambiar (Thilakan), smuggler and underworld don, find out that they were mistaken. Ananthan Nambiar believes that those in Arabic dress were CIDs. Dasan and Vijayan with the help of Dasan’s friend Balan (Innocent) get jobs at Ananthan Nambiar’s office. Dasan meets his colleague Radha (Shobana) who turns out to be their neighbour also. But soon Dasan and Vijayan gets fired by Ananthan Nambiar thinking that they are undercover CIDs. On the road again, Vijayan tries to get a chance in movies. 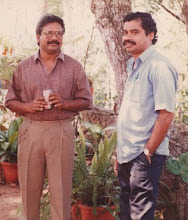 He visits noted film director I. V. Sasi’s home and meets Sasi’s wife, actress Seema. This scene is considered as one of the funniest scenes of the entire movie. Dasan, starts a small vegetable business with Radha’s help. A minor romance plot develops between Dasan and Radha. Meanwhile Ananthan Nambiar hires serial killer Pavanayi (Captain Raju) to finish off Dasan and Vijayan. But Pavanayi dies while trying to murder Dasan and Vijayan. This irks Ananthan Nambiar even more and makes him all the more paranoid about these two "CIDs". As the story proceeds to climax, Dasan and Vijayan are called to a closed factory by one of their other enemies, a politician (Janardhanan) for a meeting. Dasan and Vijayan find themselves surrounded by Ananthan Nambiar’s gang as well. However, the both gangs mistake each other as enemies and a mixed fight breaks out. Dasan and Vijayan manages to lock all others inside the building as police arrives and arrest everyone. The movie concludes as Dasan and Vijayan gets selected into the State Police as actual CID and they along with Radha drive away in a Jeep. It's stunning to your thoughtful spouse that is set up to keep up your flounder confidence each time in your life! You do have such an intriguing online journal. Much thanks to you!